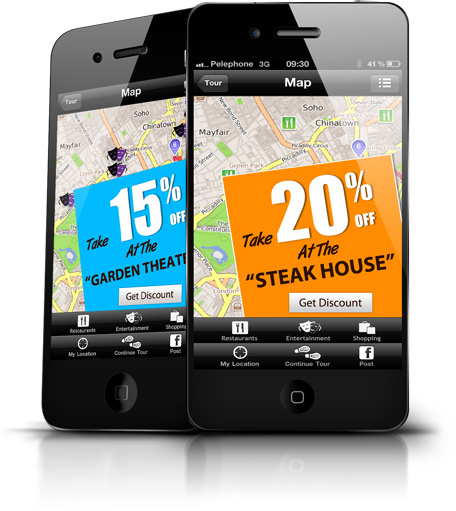 With Digital Footsteps’ unique mobile advertising solution, you can enhance your brand, expand your market reach and generate additional revenues. In addition to the direct revenues your Digital Footsteps mobile tour app will generate, you can maximize its profit potential via an advertising revenue share with Digital Footsteps. If you’d like more information, contact us today. 1 Digital Footsteps is the ONLY company that offers off-line, GPS-driven, location-based advertising so there are no roaming charges for your potential customer. 2 Digital Footsteps is the ONLY company advertising directly to tourists in their own language. 3 Digital Footsteps is the ONLY company that keeps the ads fresh and up-to-date without a 3G/4G LTE connection. 4 Digital Footsteps advertising includes information about each advertiser, coupons and special discounts. 5 Digital Footsteps is the ONLY company to navigate the tourist directly to the place of business without data roaming fees(no connection to the Internet). Include your menus, videos of the chef and images of your delicious repast. Include catalogues, images of your inventory and recommendation videos. Include timetables, pricing, videos and a call button for reservations. Include your amenities, your restaurants and your services even to visitors who are not your guests.